As the most pervasive and arguably most important form of mass communication in the world, blogging is continually at the top of the content marketing conversation. 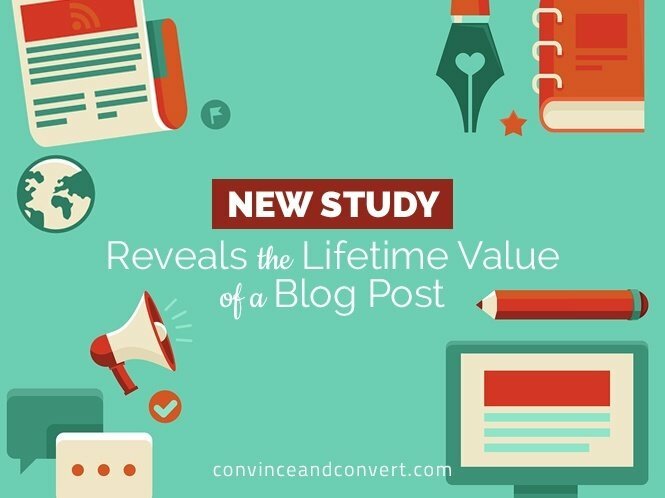 However, despite blogging’s popularity, there hasn’t been an independent study to uncover the power and lifetime value of a blog post—until now. Carried out by Halverson Group, the study revealed that the lifespan of a post is nearly 24 times the currently accepted measurement of 30 days (e.g. unique monthly visitors), showing that traditional measurement practices are not only imprecise, but significantly under-valuing the performance of a blog post. The study found that only after two years will a blog post obtain 99 percent of its impressions. Only then, or by calculating for that timeframe, can true value be determined. More on that in a bit, but let’s talk about how we got our results first. As part of the study, The Halverson Group evaluated 62,863 blog posts generated between August 2010 and February 2012. The team then randomly selected a quantitative sample of 500 unique blog posts, sourced from IZEA’s Creator database to ensure the results were both defensible and reproducible. In addition to a blog’s lifespan, the study revealed that a blog post goes through three distinct “life phases,” further contradicting the historical use of a 30-day measurement period. The study found that by day 700, a blog post will receive 99 percent of its total impressions. A 700 day lifespan indicates that blog posts are an annuity that provide value over a significant timeframe. This is an important data point for both blog owners who are looking to monetize their blog content and marketers who are looking to maximize return on their marketing spend. Shout: The “Shout” phase yields an initial steep spike in impressions that occurs within the first week to ten days, when 50 percent of a blog post impressions are generated. Echo: The “Echo” phase begins shortly thereafter and lasts until day 30, when 72 percent of blog post impressions are realized. Reverberate: The third, and likely least studied, phase in a blog post’s life cycle is the “Reverberate” phase. This phase makes up the 28 percent of remaining impressions and lasts from day 30-700. The Reverberate Phase is important for both content creators and marketers, as that is where the long tail value occurs. 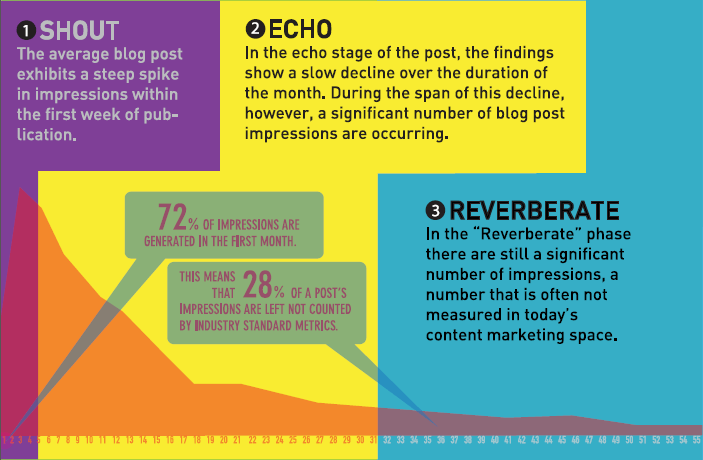 It is also the phase that most blog post impression metrics fail to take into account and quantify. 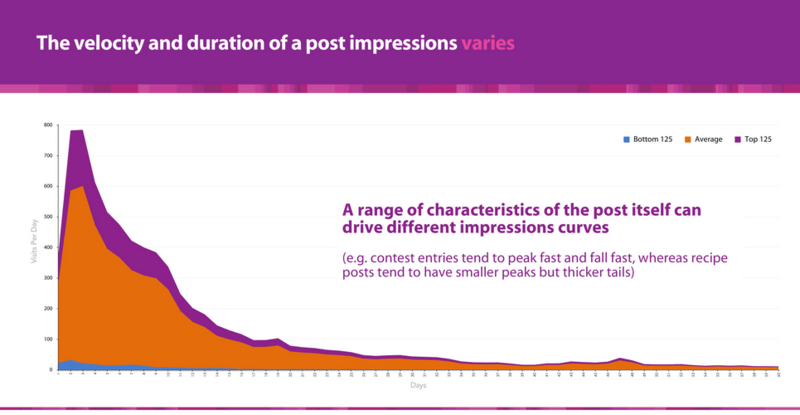 The study also confirms what many marketers already knew: that impressions vary depending on what the post is about. While some blog posts, like sweepstakes, see a spike in engagement over the first month, blog posts on topics such as recipes and thought-leadership deliver impressions over an extended period of time. For the everyday marketer or the rank and file blogger, the study produced a research-based metric that can be used to calculate the true lifetime impression delivery of a blog post. To calculate the lifetime value of a blog post, multiply the posts’ monthly page views by 1.4x. With a life-span nearing two years, blog content, and content marketing programs that leverage blogs have an evergreen value affect—especially when compared to volume-based media, such as display or search advertising, which stop delivering value as soon as the campaign investment ends.